Every business that report tax on calendar year has their deadline to report 2018 taxes with the IRS by March 15 or April 15 based on the business type. The automatic extension period for time to file is generally 6 months. Exceptions apply for certain filers of Form 1041 and for C corporations with tax years ending June 30. An estate (other than a bankruptcy estate) and a trust filing Form 1041 are eligible for an automatic 5½-month extension of time to file. C corporations with tax years ending June 30 are eligible for an automatic 7-month extension of time to file (6-month extension if filing Form 1120-POL). See the instructions for Part II, lines 2 and 4, for exceptions for foreign corporations, certain domestic corporations, and certain partnerships with books and records outside of the United States and Puerto Rico. Forms 1040-A and 1040-EZ are no longer available to file 2018 taxes. Taxpayers who used one of these forms in the past will now file Form 1040. If you still in a mind set of seeking additional time, file IRS Extension Tax Form 4868 with the IRS and push your deadline beyond April 15. Electronic filing is now available to claim additional time to report your tax returns, at ExtensionTax.com, at an affordable rate $14.99 onwards. 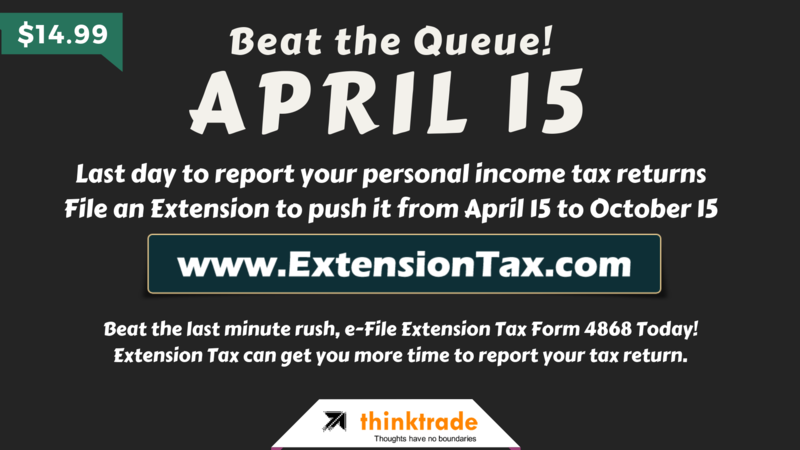 Previous PostOne Last Week Left to E-file your Extension Form 7004!Next PostList of ThinkTrade Inc.’s Tax Filing Services – You Need This Month!